AVAILABLE ONLINE ONLY. Download the document in pdf format. Early childhood education and care in Canada 2012 is the ninth edition of similarly collected information developed by the Childcare Resource and Research Unit (CRRU). These reports on cross-Canada data on early childhood programs have been compiled and published about every two years since the early 1990s. The Childcare Resource and Research Unit's ECEC in Canada reports, together with the data available in Public investments in early childhood education and care in Canada 2010 (a document developed by CRRU and published by Human Resources and Skills Development Canada (HRSDC, Government of Canada) are consistent in format, content and methodology. Thus they form a body of information that is both comparative across Canada and longitudinal over a 20 year period. This makes it possible to identify trends and developments over time -information useful for research, policy-making and advocacy. This report, published in 2013, considers early childhood education and child care (ECEC) in Canada during the period 2011 - 2012, using cross- Canada and longitudinal data. Due to cancellation of federal funding, it is more limited than were previous editions. It is a subset of the information provided in previous versions, focusing largely on regulated child care. Users of the data may need to refer back to previous editions of ECEC in Canada for information on child care regulations, specific funding programs, maternity and parental leave, information on federal ECEC contributions and detailed information on kindergarten. Note that some information on kindergarten is provided in both provincial/territorial sections and comparative tables in this report. For further information, please refer to previous editions (1992, 1995, 1998, 2001, 2004, 2006 and 2008) online and in print, to HRSDC's 2010 publication Public investments in early childhood education and care in Canada 2010 (online only) and to CRRU's The state of early childhood education and care in Canada 2010. 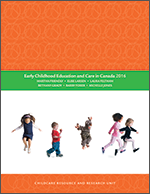 Correction December 2013: Please note that this revised version of ECEC in Canada 2012 includes a correction from the version originally released in August 2013. The Canada figures in tables 11 and 14 (total allocation for regulated child care and allocation per space) have been corrected to reflect the most recent information. We would like to apologize for any inconvenience this may have caused.